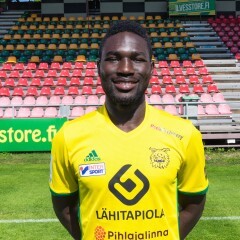 Baba Mensah is a Ghanaian center back who plays FC Llves in Finland. The well-built defender has been regarded as one of the hottest prospects monitored by the technical handlers of the senior national team. He can be at the helm of most defending positions as a center back and as a defensive midfielder. As young as he has grown in his career, the young center back has achieved an enviable feat which propels him to fight more for the bright future. It did not take too long for him to realize the talent he possessed and started playing at very tender age in his community. It was amazing the kind of player he was at the early stage of his career; he commanded respect from his colleagues as well as his seniors with an amazing performance anytime he played. Baba Mensah commenced his professional career when he was very young. As a teenager, he was already featuring in Ghana’s second tier league. He passed through a very resolute and solid life with Nania FC where he learned a lot with instant impact. Nania FC was very impressive side in the 2010/11 FA Cup, as they beat giants Asante Kototo 1-0 in the final to win the competition. The defender then joined Inter Allies after the FA Cup triumph; he walked straight to the team’s set up. He then had the opportunity to feature in the Israeli league in 2012 with Neve Yossuf FC. During the 2013/14 season, he helped the team to the FA Cup final where they won silver after losing 2-1 to giants Asante Kototo. In the 2014/15 season he was adjudged the Best defender after an impressive display for Inter Allies with 3 goals from 23 appearances out of 30. He moved to Sweden on a season-long loan stay at BK Hacken for the 2016 season where he had a decent number of games under his belt. The former Ghana U-20 star defender then moved to Viborg FF in Denmark before the start of the 2017 season on a six-month loan deal. He is currently with FC Llves in Finland. Performing on international stage, he’s one of the very few that has featured for all the generational groups for the country. He featured for the Ghana U17 in 2011, U20 in 2013 – the side that won silver in the U20 African Championship in Algeria and bronze at the World Cup in Turkey. He was an integral member of Ghana’s Olympic team in 2015, the same year he featured for the Home-based Black Stars and later featured for the Black stars in October in an intentional friendly match against Congo in Brazzaville.